"Our laypeople are the heartbeat of our church and it's just great to honour their ministry in this way," said Bishop Susan Bell about her first Order of Niagara induction service held on September 30, the Feast of St. Michael and All Angels, at Christ's Church Cathedral in Hamilton. Each year, the diocesan bishop inducts a select group of lay people whose contributions to the life and ministry of their parish, the diocese or the wider church have been outstanding. 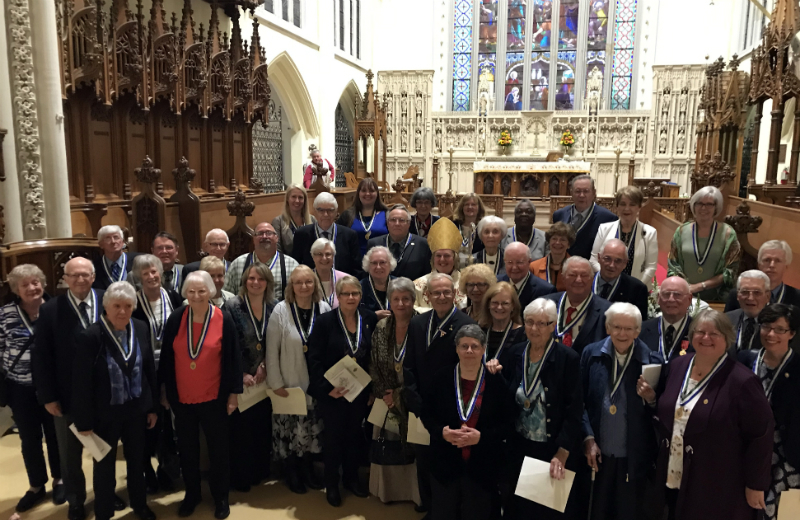 This year 49 people were welcomed into the Order of Niagara by the Bishop. Addressing the recipients, Bishop Bell remarked, "Your service is truly the service of God, and your ministry, that of angels." Created by Bishop Ralph Spence in 2000, rectors are invited each year to nominate a person whose extraordinary ministry contributions have equipped the Church - locally, nationally or internationally - to more faithfully live into God's mission. Archdeacon Michael Patterson was also collated as the regional archdeacon for Trafalgar at the same service. His appointment marks a return to archdiaconal ministry, as Archdeacon Patterson previously served as the Archdeacon of Niagara during his tenure as diocesan executive officer. The Niagara Anglican newspaper has highlighted the profiles of five of this year's recipients; read them here.